Prominent & Leading Manufacturer from Pune, we offer reboiler system and radial flow evaporator. The Reboiler System is intended to replace the Water Treatment Plant (WTP) which at present is an essential requirement in all cogen projects having high-pressure steam generators. The most important function of the WTP in cogen projects is to reduce silica in the raw water to permissible levels. 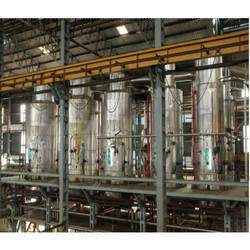 The installation generally consists of Pre-treatment section » Ultra filtration » RO » Mixed bed softening plant. 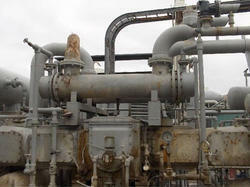 The Reboiler System aims to replace the WTP altogether. The system mainly consists of a multiple effect evaporator working on surplus vegetal vapour condensates from the factory process. Vapour condensates as such are not suitable for direct use in high-pressure boilers. The RB system distils the vapour condensates and furnishes distillate free from the impurities in the vapour condensate. The steam flow path distance – increases due to higher heating surface area and calandria diameter. Because of maintenance of uniform steam velocity and reduced distance travel the tubes at the centre point’s temperature are also maintain to result more evaporation. In radial flow type Evaporator apart from the above the condensate is collected at the centre so that the water stagnation and loss of heating surface area is minimized and the condensate flows in the same direction of steam flow to the centre point. Non condensable gases are also taped at the centre and the loss of heating surface area at the top of the tubes is minimized. Further to improve the first vapor required for juice heating is taped from the centre point and the calandria is made swiping type so that the heating surface loss is totally eliminated due to condensate and non condensable gases. This is the basic principle adopted in radial flow type in conventional evaporator bodies in vary high heating surface area to get maximum evaporation rate. Similarly for prolonged operation of evaporator body the juice distribution should be ensured for uniform flow to prevent starvation of juice to the heating surface. This reduces the rate of scaling. The juice o path distance – increases due to higher heating surface area and calandria diameter. The juice outlet is multi down take at appropriate points from the top of the tube plate to prevent longer travel of juice to the centre point. utlet is multi down take at appropriate points from the top of the tube plate to prevent longer travel of juice to the centre point. Looking for Boiling House Equipments ?